Aesthetics Awards here we come! We’ve been chosen as finalists for the Aesthetic Awards Best Clinic in the North of England! 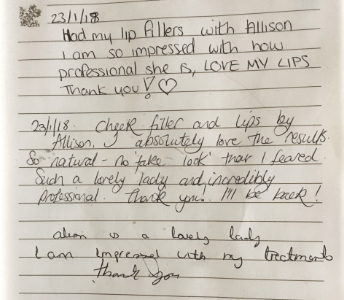 It’s such an honour to be recognised as among the best clinics in the country and a very gratifying recognition of Allison’s dedication to her clients. Great news! There will soon be an injection for under-chin fat! 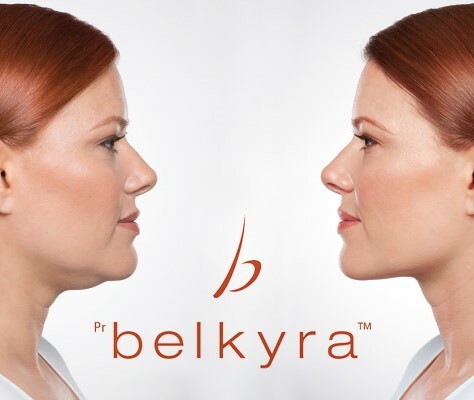 BELKYRA is the UK name for Kybella a revolutionary new treatment produced by Allergan, the makers of Botox and Juverderm. This exciting new treatment is designed to precisely target and dissolve fat beneath the chin, a great new way to treat this difficult area. It’s showing significant results in over 90% of patients. We expect Belkyra to be passed for use in the UK towards the end of 2018. If you’d like to know as soon as this treatment is available please let us know via our contact page HERE. Our training courses go from strength to strength! Another Six Course Package long weekend is underway and once again our students are loving it! Allison is so engaging and generous with her knowledge and the small groups mean our students can really get involved and interact. 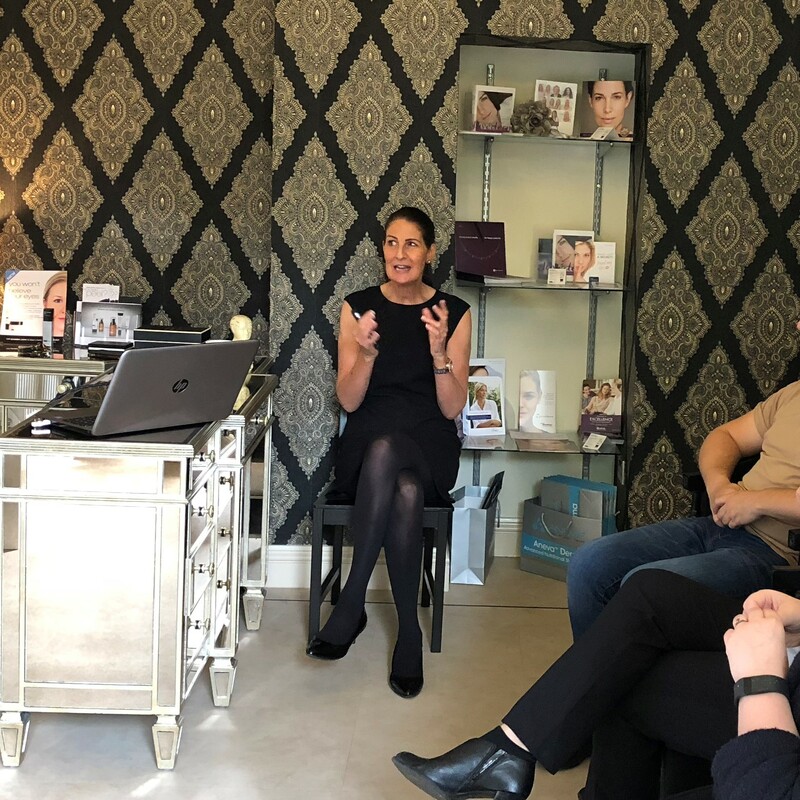 Our students, who began yesterday, will finish on Monday with CPD and insurer-approved qualifications in Botox, Dermal Fillers, Lip Augmentation, Chemical Peels and Microneedling. They’ll also be fully prepared to begin their practices by our Medical Aesthetics Practice Management Course. April was our busiest month ever! I love talking to new clients and hearing that Allison was recommended to them by a friend. So many of our clients are now coming to us this way. Allison is committed to constantly developing her skills and making sure her clients have the best possible experience and results and this is reflected in the way people talk about her to their friends. 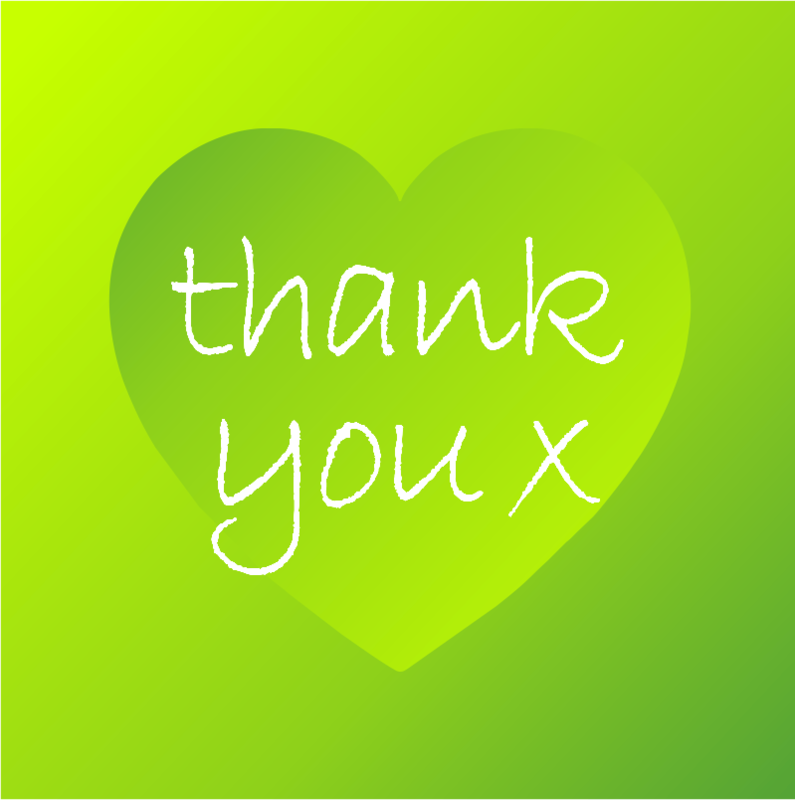 Thank you so much to everyone who is recommending us. We really do appreciate it. Why are more and more young people choosing Botox? We’re all aware of the properties of Botox as a treatment for established wrinkles but how many knew that Botox is even more effective as a preventative measure? Well, it seems an increasing number of young people are beginning to understand that, rather than treating wrinkles after they’ve formed, it’s better to get in early and prevent them from forming in the first place. Botox relaxes the muscle activity that causes our faces to make lines. Its ability to smoothe out active lines has made it the world’s most popular aesthetic treatment. But, by beginning Botox treatment before these lines have begun to form it’s possible to stop the clock and prevent them from forming almost indefinitely. The appeal of Botox as a preventative is only just reaching public perception but we believe, sooner or later, it’s set to explode. My favourite picture of Allison. I love this picture of Allison which was taken when she was hosting the Mayor in her role as President of The Inner Wheel last year. 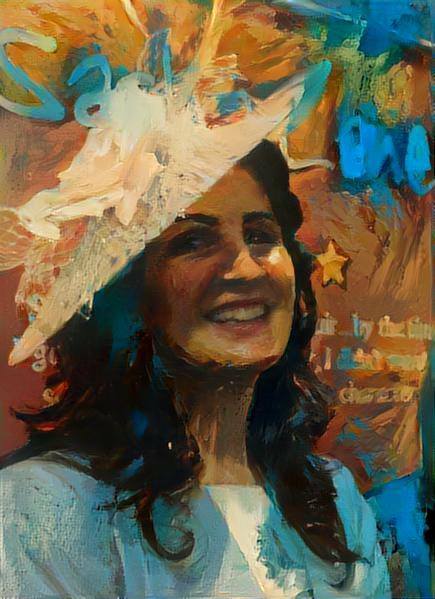 The photo was treated using an app. It hardly seems possible to look at Facebook or open a beauty magazine without seeing something about a “pain free, no needle Botox alternative”. This claim suggests two things: Firstly, that Botox injections are painful and secondly that there is such a thing as a Botox alternative. Botulinum Toxin A relaxes muscles restricting the movements that cause active lines. This not only greatly reduces the appearance of active lines but also stops the worsening of existing static lines and the formation of new ones. This effect normally lasts for 3-4 months. There is no alternative treatment that can do this. Creams may hydrate and plump the skin for a few hours but they won’t stop you forming active lines and they won’t stop you making new static lines. The needle used for Botox injections is tiny and looks nothing like those pictured in some ads designed to frighten you. Allison’s clients regularly tell her they hardly felt a thing, in fact many are surprised to be told the treatment has finished – they were waiting for the pain to start. 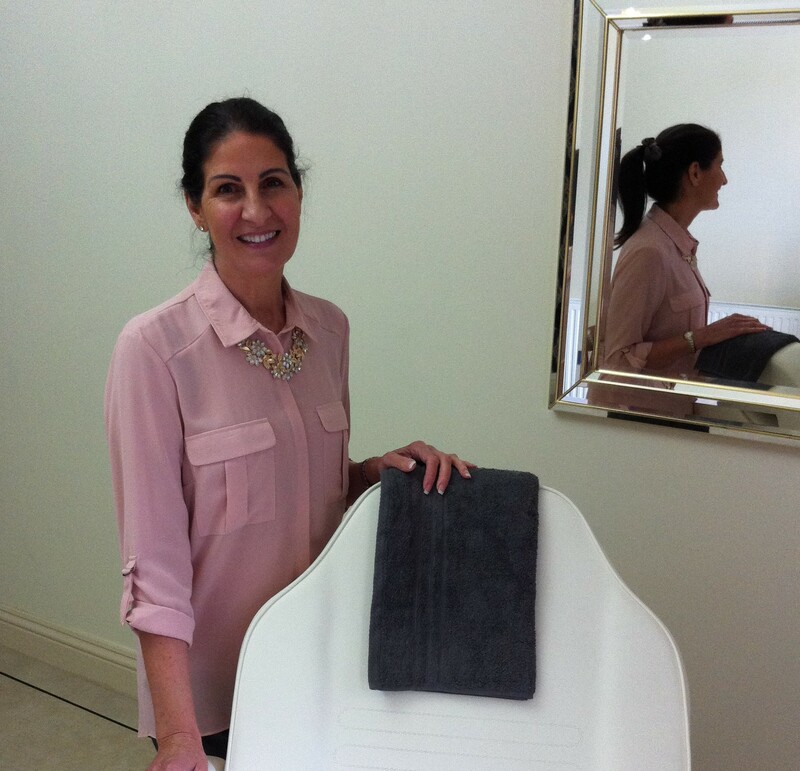 If you’d like to pop in for a chat with Allison about any of our treatments please call or message. Consultation is free and there’s no obligation. Allison will take a look, listen to your concerns, advise on your options and answer any questions you have. Well that’s another year gone and it’s been a pretty good one. The highlight of our year was the engagement of Roberts and McCarron. Allison had no idea it was coming. So now we have a wedding to plan! We’ve worked really hard this year but it hasn’t felt like work. 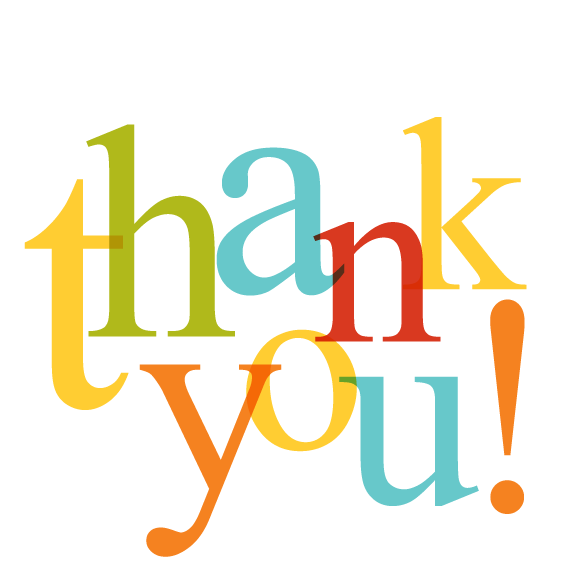 Our clinics continue to go from strength to strength with so many clients now coming by recommendation. In the new year we’ll be launching our training programmes and medical supplies service. We’re really looking forward to helping new practitioners develop their practices. If we can pass on just a little of Allison’s skill, professionalism and gentleness I know there will be some great successes. Happy new year to all our lovely clients and those who will become clients in 2018. We hope the year is kind to you. Dermaplaning removes the uppermost layer of dead skin cells revealing the lovely fresh, new skin below. It also removes the vellus hair, the very fine, soft hair that can cause skin to look fuzzy and dull. Allison uses a special blade to take away the dead skin and hair and then applies a nourishing post-treatment balm while the skin is at its most receptive. This treatment costs £50 and takes around half an hour from beginning to end. 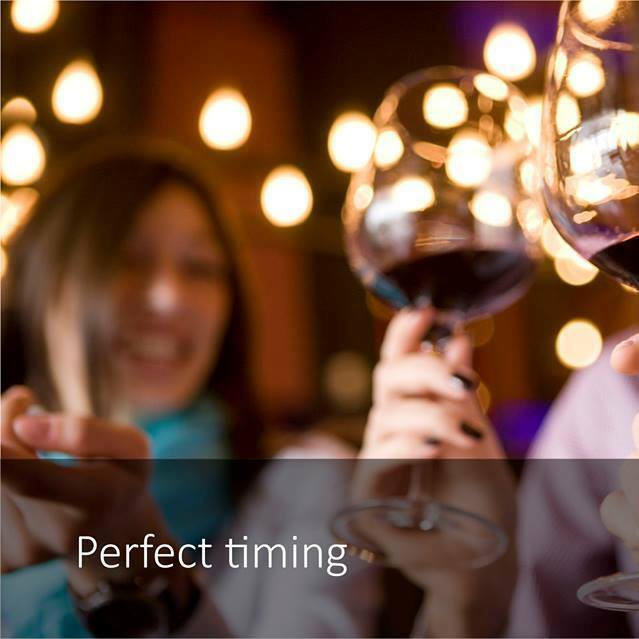 Please call 01226 491144 to book. 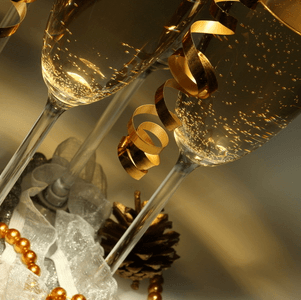 It seems way too early to be talking about it but the party season has a habit of sneaking up on you and it’s as well to plan your treatments ahead to get the timing just right. We made 8 appointments before 11:00 this morning! 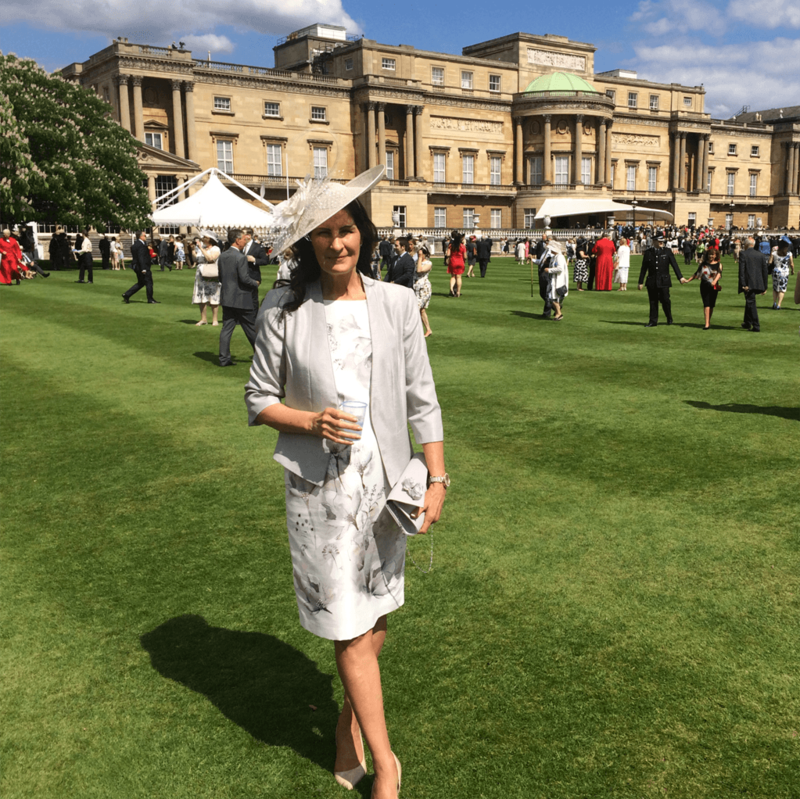 Earlier this month we attended the Royal Garden Party at Buckingham Palace where we met some amazing people from all walks of life. It was a very sunny day and lots of people were feeling the heat but Allison was as elegant as ever. Roberts and McCarron are to be married! Today I proposed to Allison and she said yes! 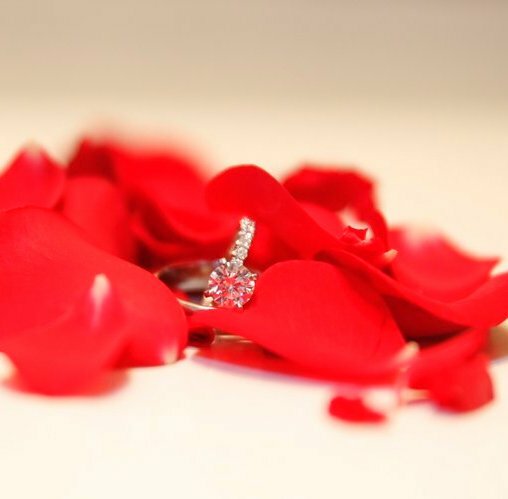 So, to add to this fantastic year we now have a wedding to plan. We won’t be changing the clinic name to “McCarron McCarron” though. I’ve insisted that we keep the “Roberts” in honour of Allison’s brilliant career. 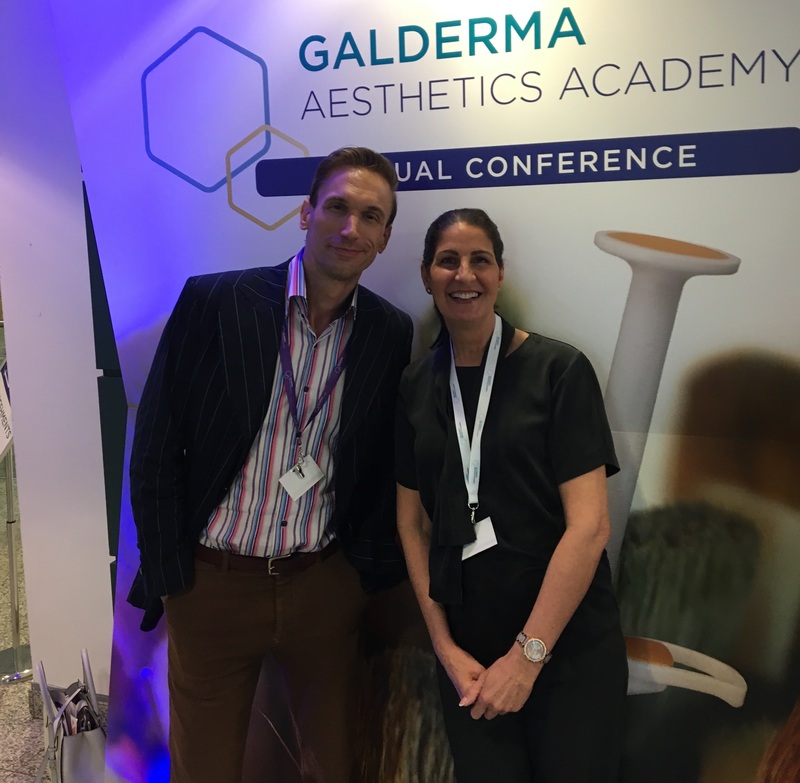 Allison with Dr Christian Jessen at the Galderma conference today. Dr Jessen is best known for presenting TV shows such as Embarrassing Bodies and Supersize V Superskinny but today he was speaking in his role as an Aesthetics Practitioner. We now have exclusivity covering much of Yorkshire on PCA Skin’s luxury medical skincare range. PCA Skin was voted No1 medical skincare range in the USA. Over 1,000,000 peels alone are performed each year using PCA. These are pharmaceutical grade products for in-clinic use by medical professionals only. Allison is now on the national board of The British Association of Cosmetic Nurses. 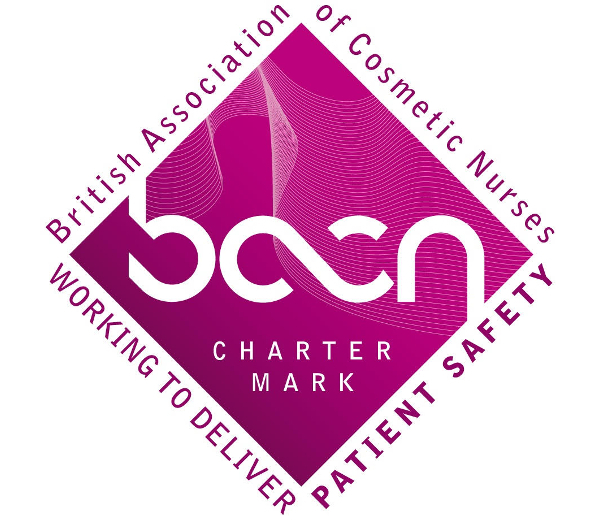 The BACN is the largest Professional Association for nurses carrying out cosmetic treatments in the UK. It operates under a strict Code of Conduct in order to ensure patient safety across all treatments undertaken by its members. Despite traditionally being a quiet month in beauty February was our busiest month ever. March is already filling up and looks set to beat it. Today was our busiest day ever even though we had two cancellations. 24 new clients have been to see Allison in the last 17 days! 8 in the last 3! 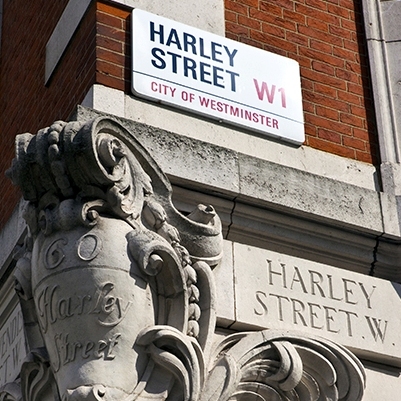 One of the most essential requirements of an expert aesthetic practitioner is the ongoing development of their skills. Only by engaging in a busy programme of continued improvement is it possible to offer clients the most up-to-date treatment methods performed by the most knowledgeable and skilled aesthetitician. Allison regularly attends masterclasses around the country and is Harley Street trained in advanced filler and Botulinum Toxin techniques. The field of clinical cosmetics is constantly evolving and it’s very important that developments in products and techniques are shared between fellow professionals. 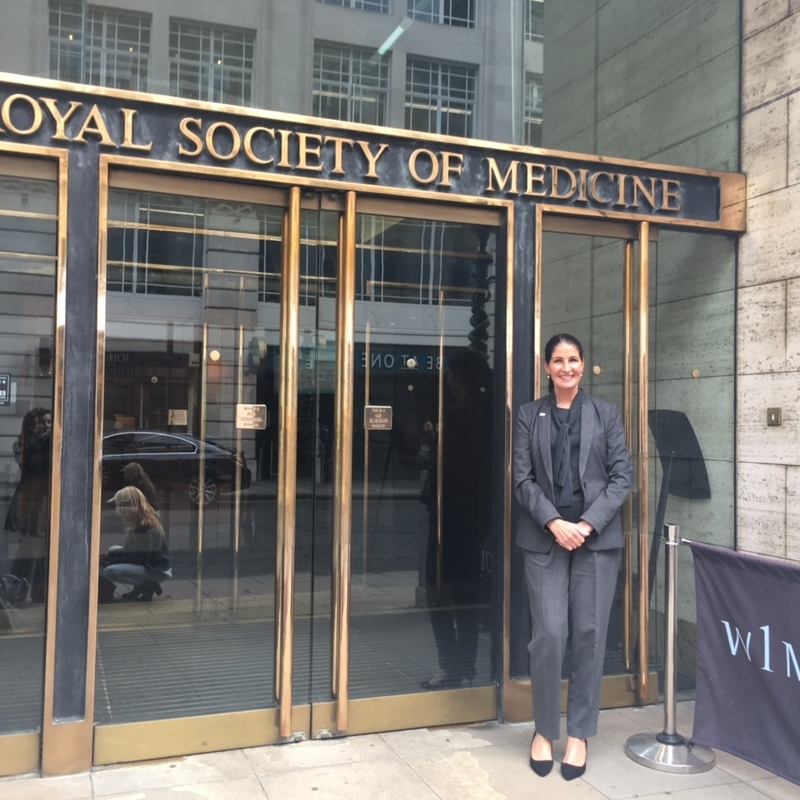 Today Allison attended a talk with live demonstrations and hands-on training at the Royal Society of Medicine in London. Amongst the procedures covered were the very latest methods in Botox therapy and dermal fillers. 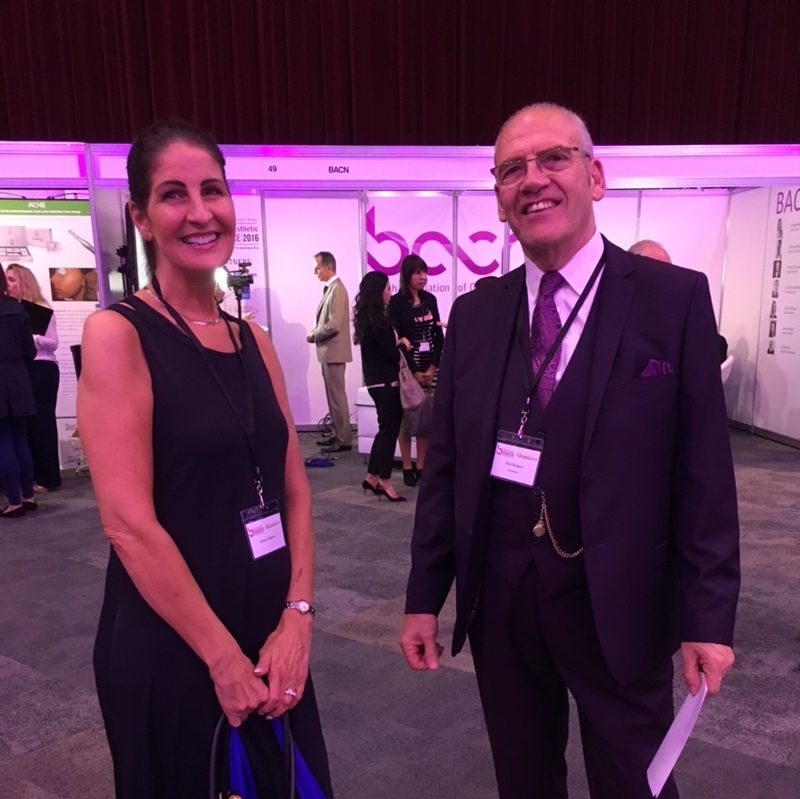 Allison at the BACN Conference with Chairman, Paul Burgess. The British Association of Cosmetic Nurses is the largest Professional Association for nurses carrying out cosmetic treatments in the UK. It operates under a strict code of conduct in order to ensure patient safety across all treatments undertaken by its members. The BACN Charter Mark indicates that a clinic has met a list of strict criteria and is working under the BACN Code of Conduct. Only BACN members who have fulfilled all of the agreed criteria for membership and conduct and are current members may display this mark. Finally, a way to renew both layers of your skin. Why should we care about what’s happening below the surface of our skin? Because the epidermis (the upper layer) is thin and transparent so the dermis (the lower layer) plays a large part in our appearance. Most of us know that the surface layer of our skin (the epidermis) continually renews itself. Unfortunately the lower layer (the dermis) does not. At least not naturally. But there is a way to trick the dermis into renewing itself. This method is called microneedling. All the stars are doing it and it’s here to stay. Feeling too old to be beautiful? 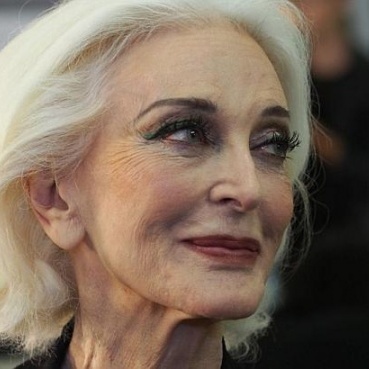 Carmen Dell’Orefice turned 85 last month. Generally accepted to be the world’s oldest working model, Carmen first appeared in Vogue in 1946 and has been cover girl four times. She still appears in advertising campaigns and the world’s top fashion magazines. Carmen puts her health and vitality down to a good sleep, a good swim and not worrying about her age. Protect your skin from the one thing that ages it more than any other. Much of the outward evidence of skin aging is down to collagen depletion and nothing causes collagen depletion more than exposure to sunlight. 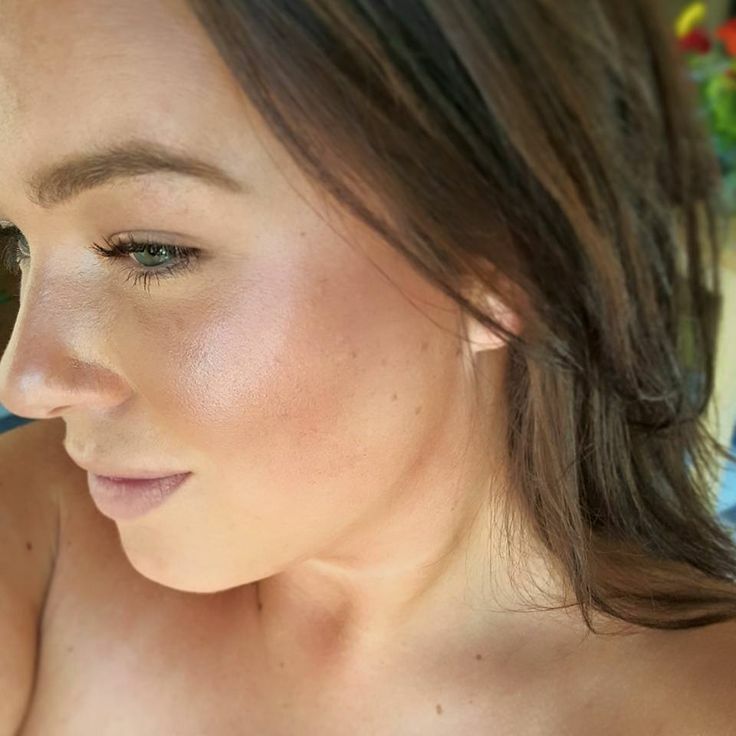 And you don’t have to sunbathe for this to happen, harmful rays are bouncing around and attacking your skin from sun up to sundown all day every day, even in winter. Use a moisturiser with a sunscreen added every day and always use a sunscreen with a good SPF when out on sunny days. Get your chocolate fix without all the fat and sugar. Chocolate (cocoa) is really good for you. So are bananas and so is milk. So here’s a great way to get your chocolate fix and stay healthy. 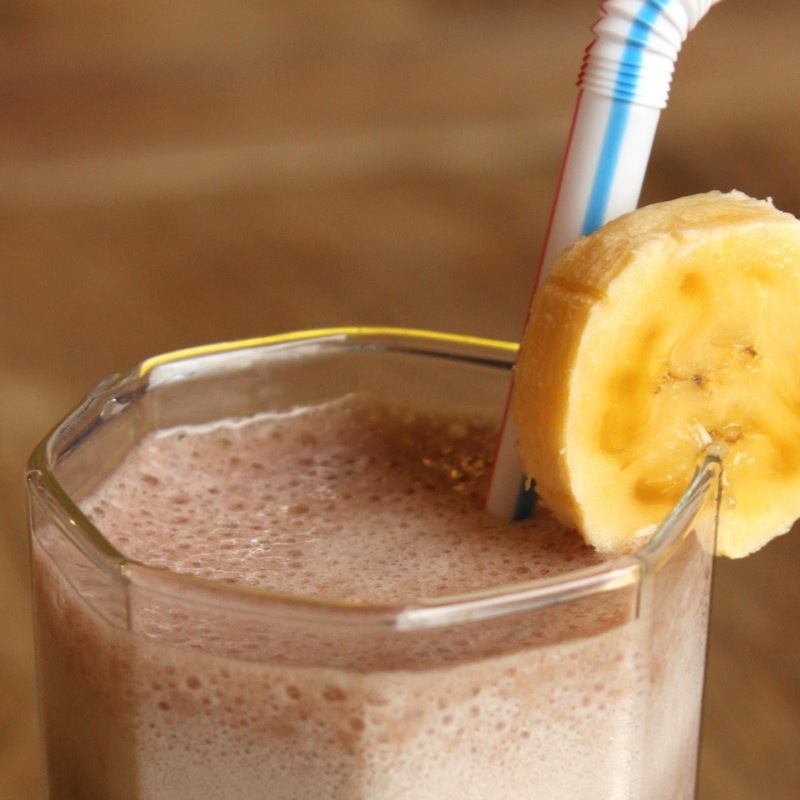 This will make two big glasses of choc/banana milkshake at 200 calories each. These drinks are actually meals. It’s so gratifying to know that people appreciate Allison’s lovely nature.